This Sunday's readings are all about hospitality. First, we hear of Abraham greeting three divine visitors and then in the Gospel, Martha and Mary attend to their visitor Jesus, albeit in different ways. Their story highlights two important aspects of hospitality. In our first reading (Genesis 18:1-10), Abraham goes overboard in hosting his visitors, but also takes time to listen and be attentive to his visitors. His reward is the promise of a son in his and his wife Sarah's old age. "Abraham hastened into the tent and told Sarah, 'Quick, three measures of fine flour! Knead it and make rolls.' He ran to the herd, picked out a tender, choice steer, and gave it to a servant, who quickly prepared it. Then Abraham got some curds and milk, as well as the steer that had been prepared, and set these before the three men; and he waited on them under the tree while they ate. They asked Abraham, 'Where is your wife Sarah?' He replied, 'There in the tent.' One of them said, 'I will surely return to you about this time next year, and Sarah will then have a son.'" 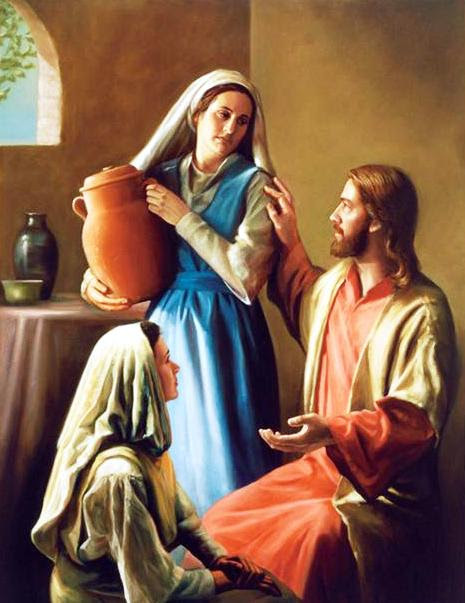 In our Gospel reading (Luke 10:38-42), Jesus seemingly rebukes Martha for her fretting about preparing the meal and complaining about Mary's attentiveness to Jesus. Both are important, but the latter more so. Discipleship calls us to listen and be attentive to the word of God. "Jesus entered a village where a woman whose name was Martha welcomed him. She had a sister named Mary who sat beside the Lord at his feet listening to him speak. Martha, burdened with much serving, came to him and said, 'Lord, do you not care that my sister has left me by myself to do the serving? Tell her to help me.' The Lord said to her in reply, 'Martha, Martha, you are anxious and worried about many things. There is need of only one thing. Mary has chosen the better part and it will not be taken from her.'" In our Epistle reading (Colossians 1:24-28), St. Paul writes to his beloved community as he languishes in prison and tells how he "rejoices in my sufferings for your sake" as he unites his suffering with Christ and calls us to do the same. Odd as it may seem, we are closest to Jesus when we rejoice in our sufferings and unite them with his. "Brothers and sisters: Now I rejoice in my sufferings for your sake, and in my flesh I am filling up what is lacking in the afflictions of Christ on behalf of his body, which is the church, of which I am a minister in accordance with God's stewardship given to me to bring to completion for you the word of God, the mystery hidden from ages and from generations past. But now it has been manifested to his holy ones, to whom God chose to make known the riches of the glory of this mystery among the Gentiles; it is Christ in you, the hope for glory. It is he whom we proclaim, admonishing everyone and teaching everyone with all wisdom, that we may present everyone perfect in Christ."